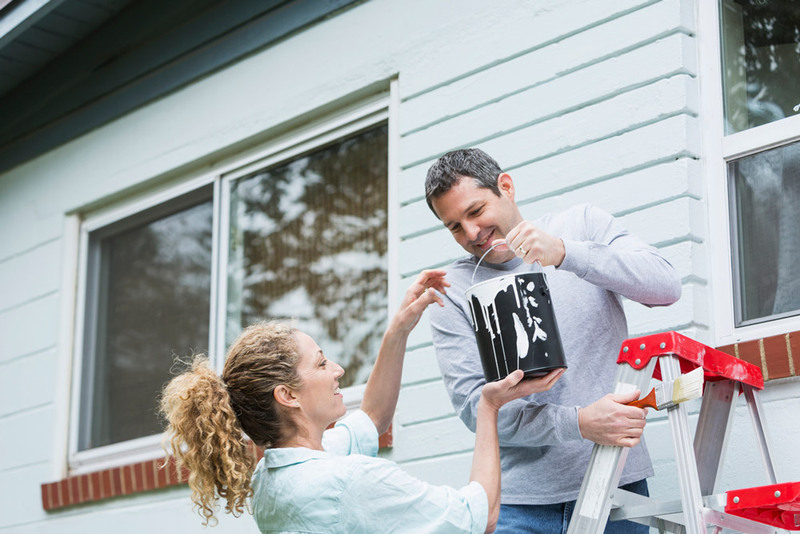 Most people think of painting as a way to make a house look pretty, but it also protects the exterior from the elements. When you’re doing it yourself, follow two simple rules: prepare the surface well and buy the best paint you can afford. First, do a quick test to determine the extent of the work. Choose an inconspicuous place where paint is at its worst. Clean the surface, let it dry and paint a small patch. The next day, press on a piece of tape and then quickly pull it off. If the tape is clean, it’s safe to repaint after washing and prepping the whole house. If the tape pulls off all the paint down to bare wood, the house needs to be stripped before it’s repainted. Most old houses are covered with oil paint. When the time comes for a new coat, you have two options: touching-up or stripping bare. You can try periodic touch-ups with oil but the paint will continue to peel as it oxidizes and becomes brittle. When it does, you can scrape off the peeling portions, prime the bare spots and repaint with latex. Areas that weren’t scraped will then peel and, as you repeat the process, your house will eventually be covered with latex paint that sticks. Alternatively, you can strip the house down to bare wood and start over with latex. This option is the most expensive up front but if done right it can save money on patch jobs and band-aid repainting in the long run. Take this route if you discover widespread paint failure such as aligatoring, cracking or flaking. For blistering, peeling, or wrinkling — which are normally caused by excessive moisture, heat, or humidity — you’ll have to correct the moisture that’s causing these problems before repainting. Whichever path you choose, remember that painting your house with the best paint over an unprepared surface is like trying to hang a plain piece of paper on a refrigerator without a magnet: it just won’t stick.